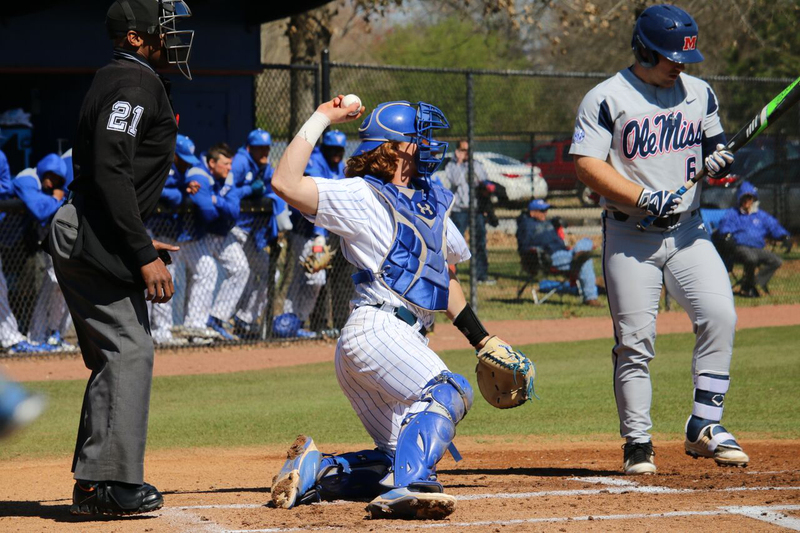 Catcher Nick Gatewood means everything to the Georgia State baseball team, according to head coach Greg Frady that is. Gatewood emerged as a premiere ball player with the Panthers during his sophomore year with the team and has continued to soar and build momentum well into his junior year in 2018. This sudden emergence and sustained success does not seem to be a fluke– a young love for the game, high school ball and the opportunity to develop behind another stand out catcher all have played a role in shaping Gatewood’s game into what it has become today. Gatewood, like many other young kids in Georgia, played any sport he could growing up. Then around the age of 10, baseball became his passion. This love for the game would stick with Gatewood through middle school and carry into high school, and even into travel ball. Peachtree Ridge High School is where Gatewood would call home while playing travel ball with the Upstate Mavericks. “Peachtree Ridge was an awesome program. I mean I was always playing against really high competition,” said Gatewood. While at Peachtree Ridge, Gatewood was already turning heads. He was named the No. 9 ranked catcher in Georgia and the No. 71 overall prospect in the state by Perfect Game. It was at Peachtree Ridge where Georgia State would develop an interest for Gatewood and began pursuing him as their newest recruit. “They always showed me a lot of love. They were really good to me and coming on visits were always really good. I just felt it was a really good fit,” said Gatewood. Once Gatewood became a Georgia State Panther he didn’t immediately make a significant impact. In fact, Gatewood’s freshman year was relatively quiet– from the outside looking in that is. Behind the scenes, Gatewood was getting to the field early because he’s never satisfied with his game and was working every day to improve to be ready when his number was called. He wouldn’t have to go through this process alone however, because Gatewood had a Georgia State all-time great catching ahead of him in Joey Roach. Roach, who is currently in the Tampa Bay Rays minor league system lit it up at Georgia State, garnering numerous awards and honors including first team academic All-American. Roach was the perfect mold for Gatewood to shape his game into and says he learned a lot from him and tried to do everything as Roach did. “Nick had a really good catcher ahead of him in Joey Roach. He helped him a lot,” said Frady speaking on Gatewood’s rise to prominence. In Gatewood’s sophomore year, with Roach no longer on the team, he would get his chance to show everything he had been working for. The left-handed hitter instantly began to make an impact on the team, both on defense and on offense. Gatewood led the 2017 team with an impressive batting average of .319 on the season. Also he recorded five home runs with 22 RBIs on the year. Defensively he recorded only three errors and had a FLD% of .978, two impressive feats for a sophomore. The young catcher throughout this sudden emergence impressed Frady especially. “Its harder to play Division I ball, it’s a lot more polished of a game,” said Frady. He also developed a sense for clutch moments with more than one game-tying hits. While what Gatewood was doing on the field was impressive, so was what he was doing off the field– becoming a leader in the eyes of his fellow teammates and coaches. “I think guys now kinda want me to point them in the right direction until they can find their place,” said Gatewood. Frady has much to say about Gatewood’s leadership qualities including the fact that he’s a great listener and that Gatewood leads by example. This is especially important considering the position Gatewood occupies which is catcher. It’s common knowledge the catcher needs to be a leader as well as a teacher, two things Gatewood absolutely is. Gatewood entered the 2018 season a proven battle-tested leader and player. The only thing he has to do now was continue to ride the wave of success, and so far he’s done just that. Through 21 games he leads the team in almost every category of production. He has a batting average of .359 on 78 at-bats and leads the team with 5 home runs and 14 RBI’s. At this pace the 6’2 catcher from Duluth, Georgia will by far outperform his 2017 self. Baseball is, however, a team game and he can’t do everything himself, something he recognizes but in an optimistic way. “We got a good team, we’re gonna win a lot of games, and we’re gonna be special,” said Gatewood looking ahead to the rest of the 2018 season. One thing Gatewood failed to mention was himself. It’s always about the team with him, as it should be from any leader on a baseball team.